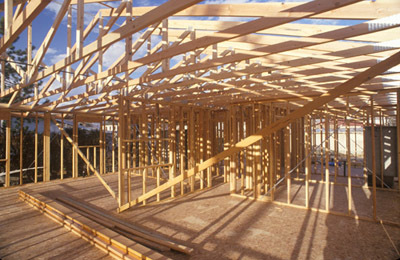 Building houses emits a great deal of CO2 and other pollutants. Common materials used are not very energy-efficient. Concrete, breeze-blocks, steel, glass and plastics are generally not very sustainable or environmentally friendly. Let me introduce you to the renewable, eco-friendly material of the future, (and the past): wood. Many architects are turning to using wood for buildings as structural components, interiors, and cladding to utilise its superior qualities. It has been estimated that a 90% carbon-reduction is possible by replacing concrete and steel with wood. Several studies agree on this and show that timber-framed and wooden buildings perform better than houses made from steel frames and concrete in terms of their impact on local water supplies and air quality as well as on energy use. 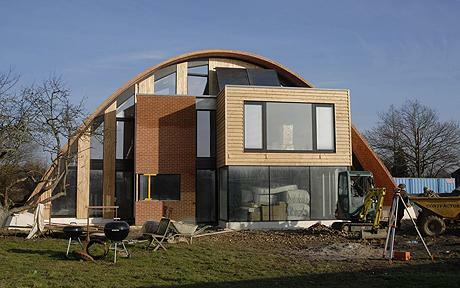 Eco-houses do not need to look like grubby, mudwalled yurts to be low-carbon. Here are several unusual, but very stylish eco houses with significant proportions of wood in their design. This unusual dome-like design is based on a Medieval technique, originating in Spain, known as ‘timbrel vaulting’. The zero-carbon building, which was developed by University of Cambridge architects as a prototype for future living, is based on a 600-year-old Medieval design that retains heat from the sun while cooling naturally in the summer. environmentally friendly, such as locally-sourced timber and recycled newspaper for insulation. The house was simple to build. It is essentially one large arch spanning 20 metres, covered on the outside with earth and plants to camouflage it and help it blend in with the rural surroundings. The natural materials mean the house can absorb fluctuations in temperature while triple-glazed windows let in as much light as possible. Any extra energy needs are provided by solar panels on the roof and a woodchip boiler. Michael Ramage,of the University of Cambridge Department of Architecture, says, "The design is cost-effective in that the home is relatively simple to build and, once you know what you're doing, it's quick. Many of the costs come from the new technology it uses for energy storage and generation. If those become more widely available, making a similar house cheaply in much larger quantities may be possible." 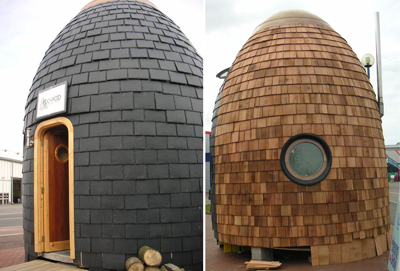 The Eco-Pod, designed by Aidan Quinn, may not be to everybody's taste, but it is a compact, low-carbon dwelling, whose structural material is a dome of moulded polyurethane and concrete, with exterior cladding of tile or cedar wood. It comes in 8, 6 or 4 metre diameters, and though tiny, claims to be a pleasant habitation. One consisting of three linked modules, has already been sold to a small family in Suffolk. Finally here is an extraordinary example of English eccentricity - a wooden house built round an 1890's railway carriage. 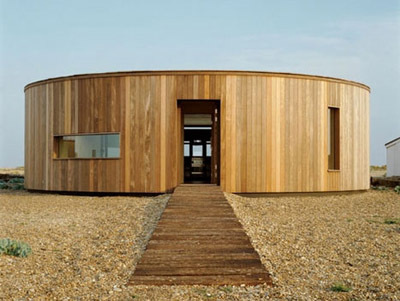 Designed by architect Simon Conder and sitting on the beach at Dungeness, El Ray is an ultra-modern home designed to both blend into its surroundings and weather the storms coming in from the sea. The two-bedroom house is a restoration and reformation of a railway carriage circa 1890 which sits at the heart of the home, now transformed into the it’s kitchen. A sloping roof invites visitors to revel in the breathtaking view out to sea. The front takes on a semi-circular form, while facing south is a fully-glazed facade overlooks the Channel.The architect used FSC-certified wood where possible, making it a sustainable choice. The walls and roof are clad in unsealed Itauba timber, a sustainably-sourced hardwood. These boards are fading to an iridescent silvery-brown that tones beautifully with the vegetation and pebbles. Adding to the eco-friendly appeal, this modern house design also incorporates passive solar power, cross ventilation and wind turbines as a source of natural heating, cooling and off-the-grid power.